Search For "Shopping & Stores" Companies in Oakridge, Oregon - Click Here Now! We Are A Small Glass Store On Highway 58 In Oakridge Oregon. Open Since May 2010, We Have Recently Expaned Our Space And Our Inventory. Carrying imports From Around The World And Other Art Created By Local Artists. Our Glass Art Is Mostly Created On Site With A Large Viewing Window For Customers To Watch And Enjoy. 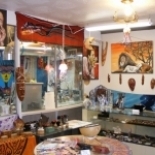 Mayfire Glass Arts & Imports LLC in Oakridge is a company that specializes in Department Stores. Our records show it was established in Oregon.